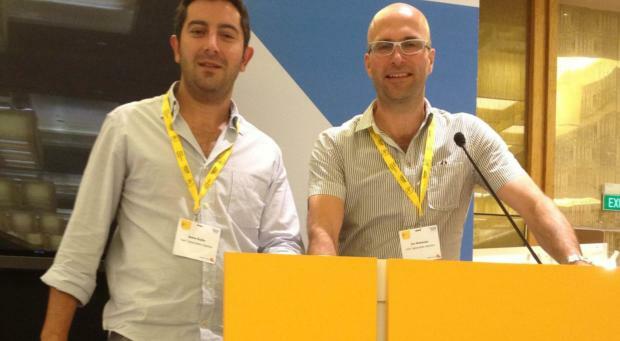 At the start of October, Jon and Emre travelled to Singapore to attend the World Architecture Festival 2012. Recently heralded in The Straits Times as the “Oscars of the Architectural World”, the event brought together the very best in architecture and design from all over the world. ‘i-am’ were there to celebrate the success of their project with security product specialists, Kale Kilit. Kale Kilit’s showroom beat a huge number of international ventures to win a spot on the Shortlist of the Display Category, impressing judges with the unique design and innovative interactive elements that ‘i-am’ designed to help customers engage with the brand. Congratulations to both the ‘i-am’ London and Istanbul teams for their hard work on the project and to Kale Kilit for giving us such an exciting canvas to work with! Kale Kilit nominated at WAF 2012!